I simply love leftovers and even taking a few lonely ingredients and turning them into a deliciously spicy meal. South Africans are braai fanatics and like most homes there are always a few sausages, grilled steak and chops in the refrigerator. 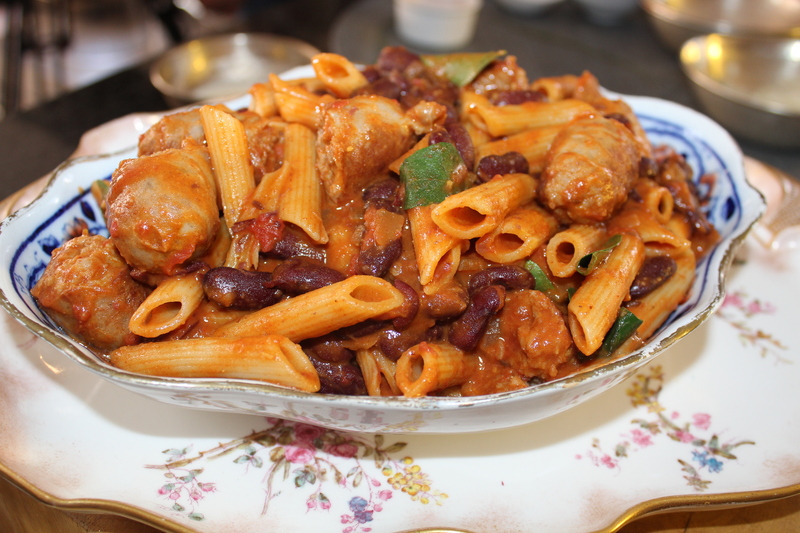 Sausages and baked beans used to be a childhood favourite. I am quite the ‘can fan’ and always have a well stocked pantry. There are beans of all shapes and sizes in the cupboard….butter, baked, kidney, three beans and….my love for beans even earned me the name, ‘Bean Bomber’! This is a one pot meal that will definitely become a Sunday night fave. The sausages soak up the lovely tomato gravy, keeping them moist and spicing them up at the same time. As I said on the show, allow two sausages for a greedy portion but even one would do nicely! A big thanks to the AMC cookware team in Cape Town who keep the Holi Cow kitchen well equipped with the latest cookware! Also a very big thanks to Mrs Pat Tarr and the Broadacres Superspar team for sponsoring the ingredients for my blog. Before we move onto the recipe, just a quick update on the competitions. The winner for the AMC competition will be drawn on Sunday, 3oth November after Mela! Please stay tuned on twitter and Facebook for the announcement. The KitchenAid stand mixer competition will be drawn on Sunday 13th December. Heat the sunflower oil in a AMC paella pan. Fry the bay leaf and the cinnamon stick for few seconds. Once the bay leaves turn a shade darker, add the cumin seeds. Fry until the seeds begin to splutter and then saute the onion with salt until pale golden in colour. Add the crushed garlic and stir for a few seconds, then stir in the mixed masala. Add the tomatoes and cook until the sauce thickens – the tomatoes should break down completely. Add the drained red kidney beans and pour in 250ml boiled water. Break the sausages into the sauce and simmer for another 2 – 3 minutes. Add the cooked pasta to the sauce and simmer until the pasta is heated through – add more water if the sauce is too dry. Pour the fresh cream into the pasta sauce and stir. Garnish with fresh coriander or curry leaves.